Figure 1: By the way, I found him. No. It’s not Mother Hecker calling him to dinner. Like always, I’m looking for my prayer card to prop up by the phone, minutes before the Pauli’s Associates in Diaspora virtual meeting. Once a month, Associates from around the country meet for prayer, reflection and sharing on the phone with Fr. Michael Kallock. A core group including Kathy, Rita, Reg, and I have been meeting for the last couple of years, with others joining when they can. We each share the experience of having been involved with a local group, but having moved away for retirement, job or family reasons. We owe a debt to the Associates Board and Fr. Frank Desiderio for making this connection with the Paulists and Associates possible. We’ve prayed together from the Paulist Prayer Book in the past, and more recently have followed the program in each month’s Associates World, which, along with Paulist social media, is like a lifeline for us, drawing us close to the rest of you. The challenge for the Diaspora group is not being near a church staffed by Paulists, or one with an Associates group. We all speak fondly of the people that we knew. Nevertheless, we each are involved in various ministries and activities where we live and try to bring the spirit of Isaac Hecker to what we do. For my own part, I’ve been thinking about ways to bring something of the Paulist charism to my home. I’m in the Diocese of San Bernardino in California, which has one of the largest Latino populations in the US. Last year the Permanent Diaconate, and the Lay Leadership training graduating classes were exclusively Latino, with the latter including a number of younger people. It’s fun to witness the future of the Church in America. My image of Hecker is strongly tied to his Northeastern roots. I often wonder how he translates to other cultures; that might be something for all of us to ponder in our groups. 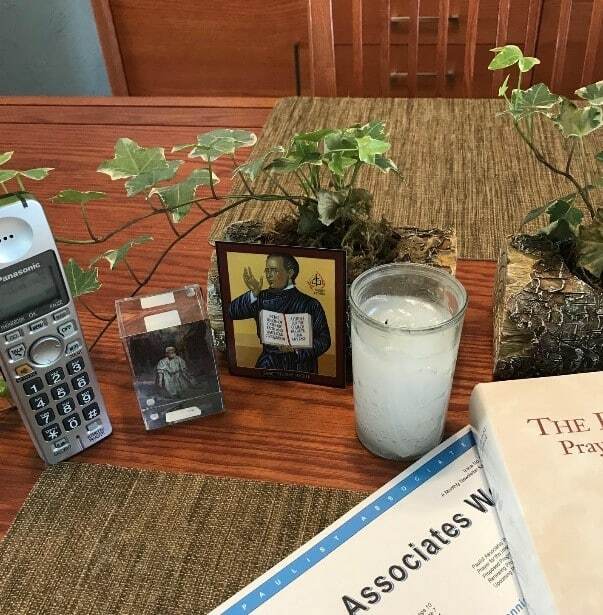 Despite our being out in the “wilderness,” know that the Associates in the Diaspora regularly pray for the rest of the Associates, Paulist priests, novices and seminarians, and support you in your work. Figure 2: Close-up of replicas of Fr. Hecker’s letters to his family. For the Birthday Bicentennial celebration of Fr. Hecker, the archive has planned the exhibit Treasures from the Vault: Highlights from the collection of Servant of God Isaac T. Hecker. There are three exhibits planned through the Bicentennial year, the first being showcased is A Glimpse into the Early Years. It highlights Fr. Hecker’s relationship with his family during his time of self-discovery at Brook Farm, shortly before his decision to try Fruitlands. It also includes some of the books that made up his personal library in his early years. A Glimpse into the Early Years is currently being displayed in the first floor hallway by the elevator, in the rectory at 59th Street. The selection of correspondence was chosen in order to illustrate the bond Fr. Hecker had with his family. The correspondence was also chosen to showcase a secular aspect of Fr. Hecker’s life that is typically not highlighted when discussing his life story. The letter from February 22, 1843 in particular displays this, as it briefly mentions his sister Elizabeth. The records in the collection related to her are very sparse, unfortunately we can only gets hints as to her relationship with the family. In the letter dated June 12, 1843, Fr. Hecker writes a line to his father, John Hecker Sr., thanking him for sending him a tract and stating his desire to accompany his father to see Dr. Krummacher. While there is a narrative that John Sr. abandoned the family early in Fr. Hecker’s life, the letters in the exhibit imply that in 1843 John Sr. was present in the Hecker household. The full extent of his role in the family is unclear at this point in time. Since we decided to focus on Fr. Hecker’s early years, this particular exhibit does not showcase the friendship between Josephine Hecker, the wife of George Hecker, and Fr. Hecker. 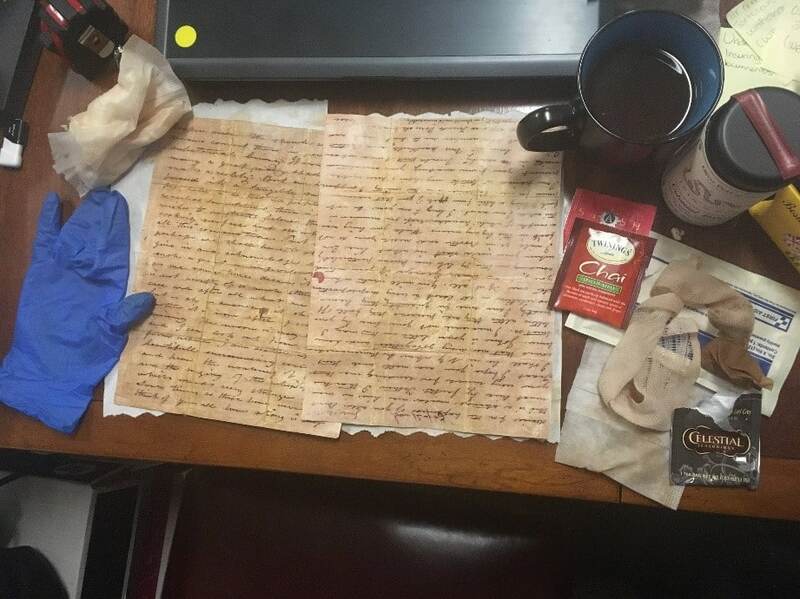 Figure 4: Twinings Spiced Apple Chai Tea provided the reddish tint, Celestial Seasons Victorian Earl Grey provided the base brown color and the gauze pad and strip created the age spots on the letters. All items displayed in these exhibits are replicas from the collection of Fr. Hecker. The original objects from the collection were digitized, not in their entirety, only specific pages for the exhibit. The majority of the scanned items were then printed on cardstock, and then cut and folded to have the edges reflect the wear and tearing of the original. 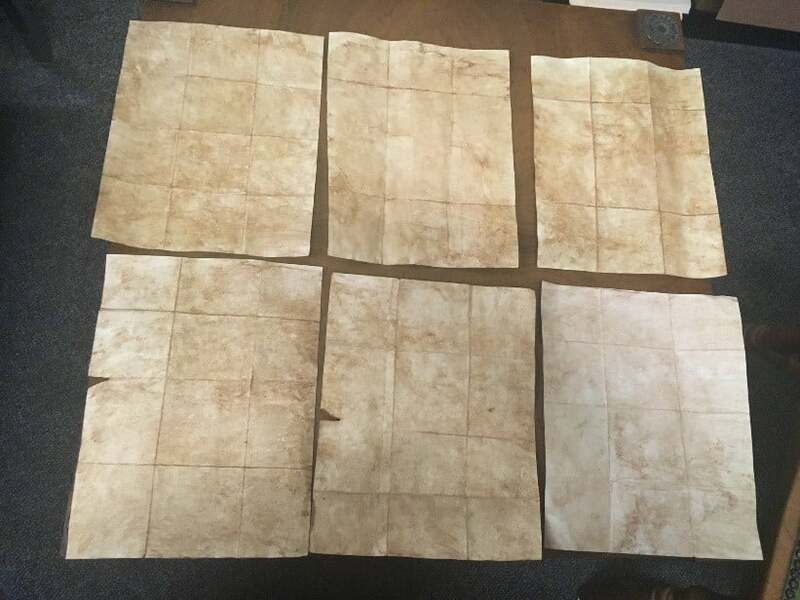 Then, to age the appearance, the letters were stained with black tea (to brown the paper) and chai tea (for a reddish tone). 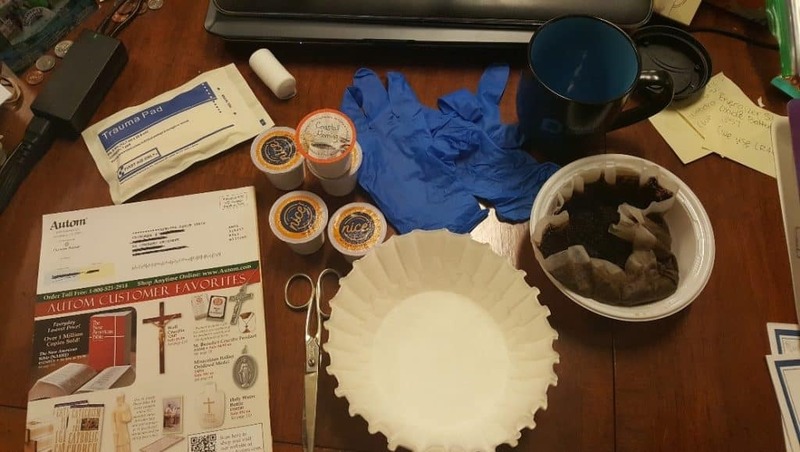 It was quickly determined that green tea did not have the desired staining affect, as it has a more yellow tone that did not match well with the original items. The transcripts were already included with the original letters; so they were scanned, ocr’ed (optical character recognition), and reprinted to accompany the replicated letters. 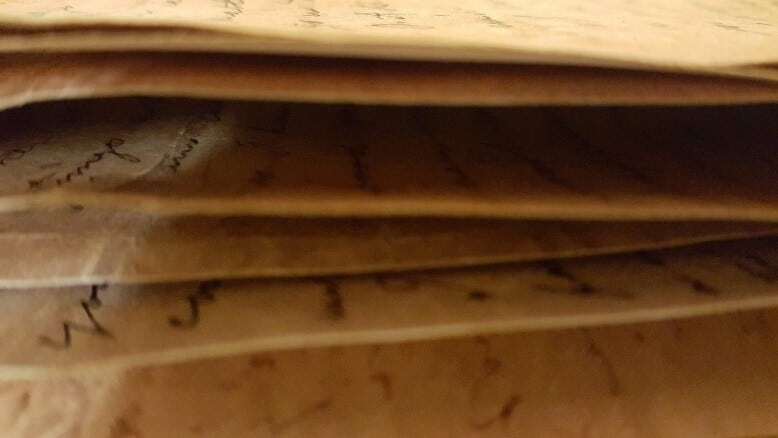 While the aging process for the letters were done relatively quickly, the process of aging the replicated books was a little bit more involved. Figure 5: The top row demonstrates the later stages of the aging process. The bottom row demonstrates the earlier stages. The replicated letters were laid out flat to dry near a heater. The scanned pages of the books had to be edited prior to printing. This was done in Corel PaintShop Pro, which is a program similar to Adobe Photoshop. None of the text was edited, but the scans were resized. For most, extra pages were added digitally to the sides to give the appearance of more volume and of an open book laying flat. For Fr. 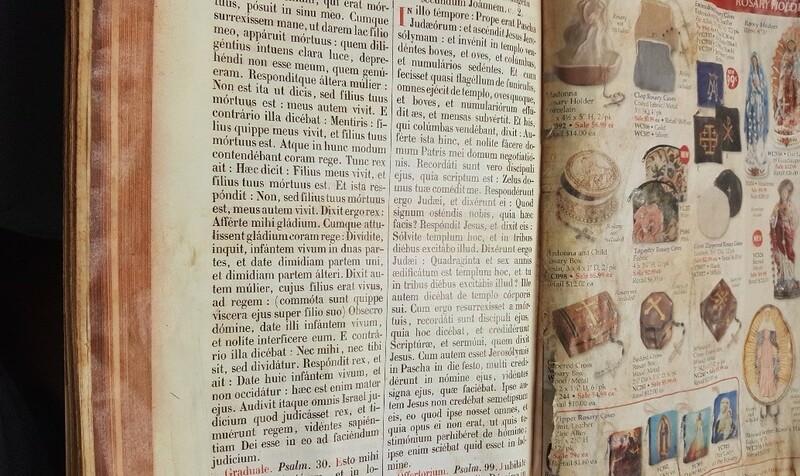 Hecker’s copy of the Missale Romanum and Holy Bible, Douay Rheims, a holiday catalog and an old finance book were used respectively as a base and the selected pages were glued on to the book. Since plain printer paper was used for these two replicas the aging process took more time. Each layer of aging needed to dry completely before the next layer could be done. The edges of the books were stained in a similar fashion as the letters, but coffee grounds were added for a deeper staining affect than the letters. A Glimpse into the Early Years will be displayed until May 2019, when it will be switched to the second exhibit Books from the library of Rev. Isaac T. Hecker, C.S.P. The third exhibit In his own words: A Future Brighter Than Any Past will be on display in December 2019 to close out the bicentennial birthday exhibit series and to celebrate his actual 200th birthday. We also plan to have a post to supplement the following exhibits. 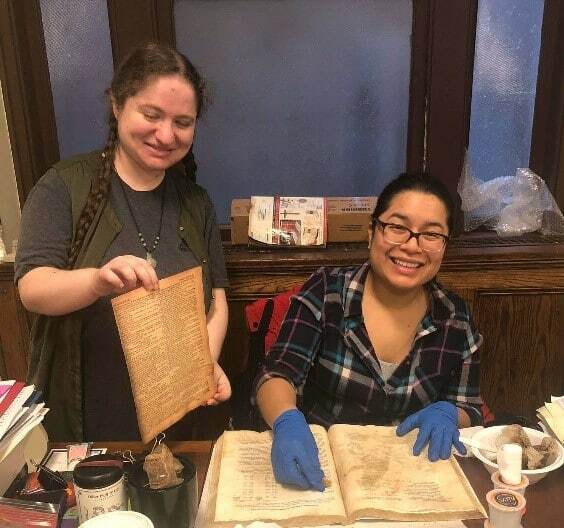 Figure 7: Michelle Levy (standing) and Christina Orozco (seated) are the Assistant Archivists of the Paulist Fathers and are based in New York City. I was born in Boston, Massachusetts and baptized at St. Anne’s parish by Paulist Father Joe Quinn. I had no further contact with the Paulists until I was 16. I had moved with my family to Los Angeles and Fr. Ellwood(Bud) Kieser preached a retreat day at Notre Dame High School where I was a student. I was impressed by what he had to say and contacted Fr. Ed Donovan at St. Paul the Apostle parish in Los Angeles. I joined the Paulist seminary in 1964 and was ordained in 1973. My ministry as a priest has included campus ministry at U.C. Barbara, the University of Texas and the Ohio State University. I served as an editor at Paulist Press and as assistant director of the Paulist Novitiate. I also was on the parish staffs of St. Philip Neri in Portland, Old St. Mary’s in Chicago and St. Paul the Apostle parish and school in Los Angeles. Since 2016 I’ve been associate pastor at Old St., Mary’s Cathedral in San Francisco. Our parish is small but diverse, serving the Chinese community of Chinatown, local business folks in the financial district and tourists from all parts of the world. My first contact with Paulist Associates came at St. Paul the Apostle parish in New York. I didn’t work directly with them but attended many Associates events and enjoyed getting to know them. I believe this was one of the very first Paulist Associate groups. Frs. Tim Sullivan and Mike Kallock worked closely with this group and I attended some of their sessions. When I went to Los Angeles I was new on the parish staff and the Paulist Associates were the first group to reach out and welcome me. They kept inviting me to their meetings and I kept attending. Fr. Ted Vierra had been serving as a mentor for the group and after awhile he asked me if I would take over that responsibility. I participated in retreats and formation sessions. The L.A. group was active and committed and the eleven Paulist priests in the house were supportive which made my participation with the associates easy. A highlight was the annual renewal of vows on the Sunday nearest January 25, followed by a great Italian dinner at the Paulist house. Fr. Frank DeSiano asked me to serve on the Paulist Associates Board around 2004 and we worked on putting together the Paulist Associates Handbook. Last year Fr. Frank Desiderio invited me to come back on the Board. I have enjoyed working with the members of the Board and getting re-acquainted with David Rooney who was a Los Angeles Associate during my time there. I look forward to participating in the Associates diaspora group and working with all of you in the next year. We are pleased to announce that with the sad passing of Cathy Hoekstra, Carol Wagner Williams has graciously accepted filling in for Cathy. Carol was next in line to replace any of the present lay associates should they not finish their term. Theme: Hecker’s Experience of God and Search for God. In the late spring or early summer of 1842 something happened, something so profound that it shook the center of Hecker’s young life and drove him into new and unexpected paths. The experienced constituted perhaps the central moment of Isaac Hecker’s life. Whatever else happened to him, he remained convinced that a power had touched his life, called him to something, he knew not what, and made him special in ways that startled him. I think that by the end of Hecker’s life, he would clearly say that this significant spiritual experience that he had in 1842 was an experience of the Holy Spirit. The Holy Spirit was calling and leading Hecker into the Catholic Church, and eventually leading him into founding the Paulist Fathers. The mystical experience Hecker had in his early life would reach its fulfillment in the work and mission of the Paulist Fathers. We all have had a variety of experiences of God. Have you had any profound experiences of God that you believe like Hecker were fundamental, foundational to your life and faith? Or, like many, was your experience of God and your faith more gradual, subtle, often coming through your experience of others, especially family and love ones? A striking characteristic of Hecker’s faith journey was as a seeker. He sought in and with the Transcendentalists a faith and a purpose to his life. So too Hecker spent time in the utopian communities of Brook Farm and Fruitlands looking for the right response to his earlier spiritual experience. His restless search eventually led him into the Catholic Church, then the Redemptorists, and finally into founding the Paulist Fathers. One might even say to the end of his life he kept seeking for a deeper relationship to the Holy Spirit and always trying to find a more effective way to spread the Gospel. As a Paulist, I can honestly say Hecker as a Searcher and Seeker speaks to my faith journey. I believe that many Paulist are attracted to the Paulists because they like Hecker were searching for a deeper relationship to God and purpose to their lives. Has your faith journey been one marked by discontent with where you have been in your spiritual life? Some come to the Paulists and the Paulist Associates after a restless journey of faith; for instance, from having no faith, or as an agnostic, or from some other religion, or from passing through other Christian denominations, or even moving from Catholic parish to parish until they felt at home in a Paulist parish. In my faith journey I remained Catholic all my life, but I was dissatisfied in the parishes of my youth and young adult life. 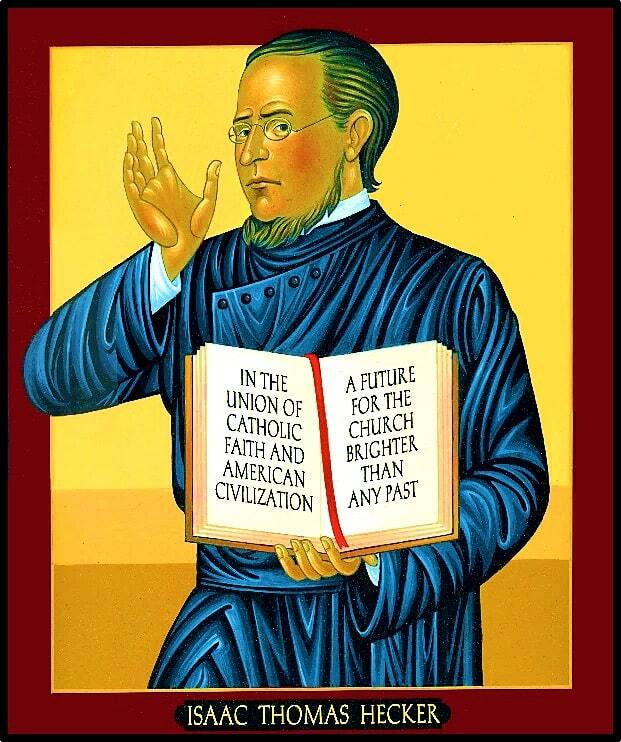 I kept searching within the Catholic church until I found my place in the Paulists and its Mission to Modern America. How would you describe your journey of faith? Has it been one mark by searching for a deeper spirituality and have you now found it in the Paulist Associates? We lift up our closing prayer to you, Servant Isaac Hecker. Help us Father Hecker to grow in our understanding of you. Help us most of all to imitate you in your confidence in the Holy Spirit. May you and the Holy Spirit lead us into living out more deeply the Gospel in our time and place.